Opinion - Is South Africa the Next Currency Crisis? Is South Africa the Next Currency Crisis? 2018 has been marked by various emerging market crises. From Turkey to Argentina, confidence has eroded, resulting in bond and currency chaos. There is a growing focus on South Africa, and our analysis suggests that will continue. South Africa, famous for Great White sharks, could be the next focus for currency vigilantes. When examining whether an emerging market country is at risk of a currency crisis, the economic indicator of choice is Import Cover. This gives a measurement of the amount of a country’s foreign exchange reserves relative to its imports. It is usually expressed in terms of how many months of imports the foreign exchange reserves are able to buy before they run out. An emerging market country with 10 or more months of import cover is considered to be stable. South Africa’s Import Cover is 5.5 months, down from 7.2 months at the end of 2015. According to World Bank data, that’s about the same as Turkey. (For perspective, China’s Import Cover is 16 months.) What this means is that there is increasing pressure on South Africa’s foreign exchange reserves, which not only have to pay for imports but also have to service the country’s external debt. Reserves are also used to defend a currency from attack via intervention, but a country with low reserves has little defense. And once the currency market sharks get a sniff of blood in the water, it can get quite frenzied very quickly. Thankfully, we do not have to guess about all the different economic variables that could or could not happen. We rely on what we consider to be the best lead indicator – the market price. The chart below shows the amount of South African rand needed to buy one U.S. dollar. The exchange rate hit a low of 11.5078 in February this year, and it currently hovers around 15. 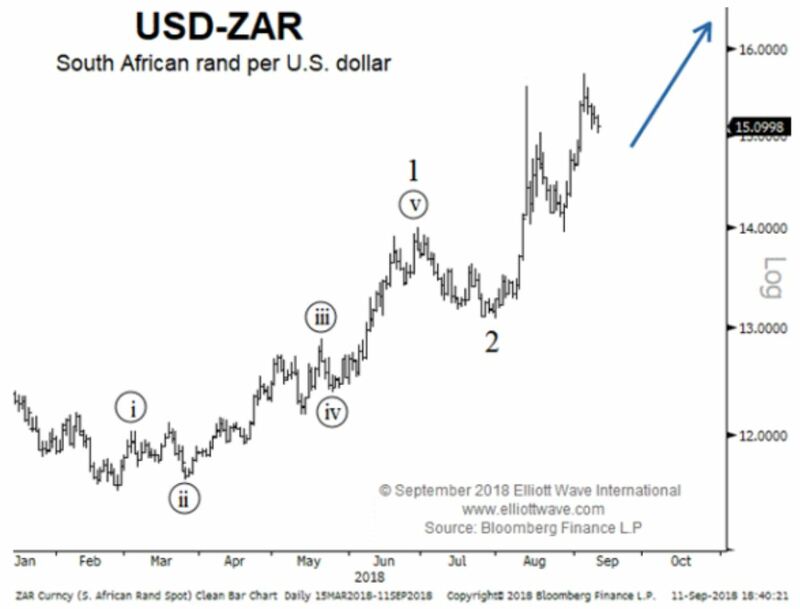 Our Elliott wave analysis is pointing to much higher levels in the exchange rate, meaning a depreciating rand. Expect fears of a South African rand crisis to grow.